Surugaya is large Japanese store, that sells various used items, mostly CD, DVD, books, comic, figurines and other small items. What is so good about Surugaya? First of all, Surugaya's logo design is very cool. Please, have a look at the preview image. Secondly, Surugaya prices are very affordable. Most of the items are admittedly used, but there are some items that look and feel almost as new, but their price is significantly lower. The prices of the items also change depending on the availability in stock. Not only price itself is very affordable, the shipping fee is also surprisingly low. For the purchases, worth less then 1000 yen, the shipping fee is 309 yen, which is already very low! For purchases, worth more than 1000 yen, but less then 1500 yen. the shipping fee is 257 yen. And, for purchases worth more than 1500 yen, shipping fee is free! These are super profitable conditions, which is hard to find in other online stores. At the same time, Surugaya's packing is pretty good, so there is low risk, that items will be damaged during domestic shipping. You can find very rare items at Surugaya, that are literary impossible to find anywhere else. Items appear randomly, because Surugaya not only sells, but also buys items, so when they get a new item, it suddenly appears on their website. The best way is to check Surugaya's site from time to time, and you can miraclously find rare item, that you have been searching for a long time. The items are mostly used, but there are no "junk" items, so everything can be used according to it purpose. The descriptions of the items are as close to truth as possible. If the item is damaged, it will be always clearly stated in description. On the other hand, if nothing is specified, it means that there is no damage or other problems with the item. Surugaya's System - How to use it. There is a field for search in the upper part of the page. Please, insert the keyword there, and search. *HOYOYO helps you! If you dont know the word for item in Japanese, please inform our customer support team, and we tell you the right word in Japanese. 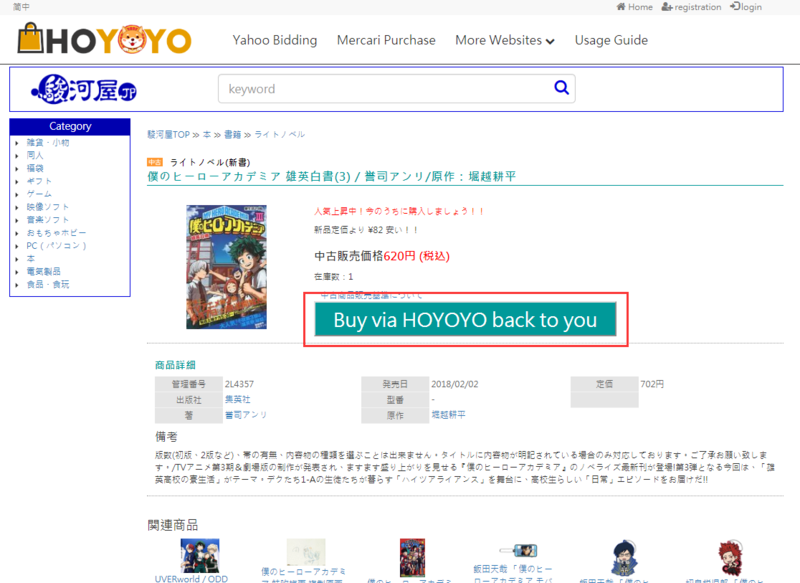 Click 【Buy via HOYOYO back to you】 then you can easily place an order at Surugaya, and HOYOYO can help you ship goods back from Japan to your door. Surugaya shop is very popular in Japan due to its prices, design and big selection of items. They are very busy, and may take some time when processing your order (1-2 weeks is a norm). We kindly ask you to be patient when ordering from Surugaya. Hope you enjoy shopping at Surugaya with the help of HOYOYO!